Design patterns are very important tools for iOS developers to keep in their software engineering arsenals. These patterns, along with several other best practices I’ll mention below, help developers to create reliable and maintainable apps. In other words, design patterns help in managing software complexity. In this tutorial, I’ll introduce you to the “Model-View-ViewModel” or “MVVM” design pattern. For a historical and pragmatic perspective, I’ll compare the very well-known “Model-View-Controller” or “MVC” design pattern, long favored by many iOS developers, to MVVM, which has steadily been gaining traction among the same group of developers. I wrote this app using MVVM, but I’ll start a prototype for the app using MVC and then refactor it into the MVVM design pattern. … “a solution to a problem in a context.” Let’s parse this by working backward through the phrase. The context is a recurring situation in which the pattern applies. The problem is the goal you are trying to achieve in this context as well as any constraints that come with the context. And the solution is what you’re after: a general design for the context that achieves the goal and resolves the constraints. Let me define some preliminary terminology and then we’ll dive into the mechanics of MVC and MVVM. Note that a search of Apple’s “Developer” portal site for “MVVM” returns “No results were found. Please try a different keyword.” But you can find a plethora of information on MVVM as applied to iOS development with a simple web search. I’ll be explaining MVVM in this tutorial, but I wanted to let you know that Apple still seems to be set on MVC — at least they’re not talking about any other overall app design patterns at this point in time. You’ll notice me referring to “views/controls and view controllers.” When I say “views/controls,” I’m referring to all the objects we use in iOS to build a user interface (UI). We can all agree that a view represents something that can be presented to the user, like a UITextView containing a paragraph of text, or controls like UIButton instances that enable someone to interact with an app. A UIView can just serve as the basic design surface on which we organize all our other controls. So “views/controls” refers to the UIView class and any other UI control meant to provide user interaction, like a UISlider. Remember that all controls, at least all the ones I know of, in UIKit, like UIButton and UISlider, inherit from UIView. In this discussion, “views/controls” is synonymous with the UIView. The view is the pale blue colored rectangle. Apple still maintains detailed and voluminous documentation on MVC in its developer library. Even though the company labels this development guidance as “retired,” the MVC bias is evident when you make use of the iOS SDKs like Foundation, UIKit, and CoreGraphics. Consider all the classes you make use of almost every day, like UIView and UIViewController, UITableView and UITableViewController, UIPageControl and UIPageViewController, to name a few. In iOS, there is a tight relationship between views/controls and view controllers. Yes, you could write your entire UI programmatically, but I would consider that silly, especially in any sizable app, especially when considering screen layout (Adaptive Auto Layout). Programmatic UIs are impossible to manage and scale. Yes, once in awhile, the need arises for a few lines of code which effect the UI, but the whole UI? 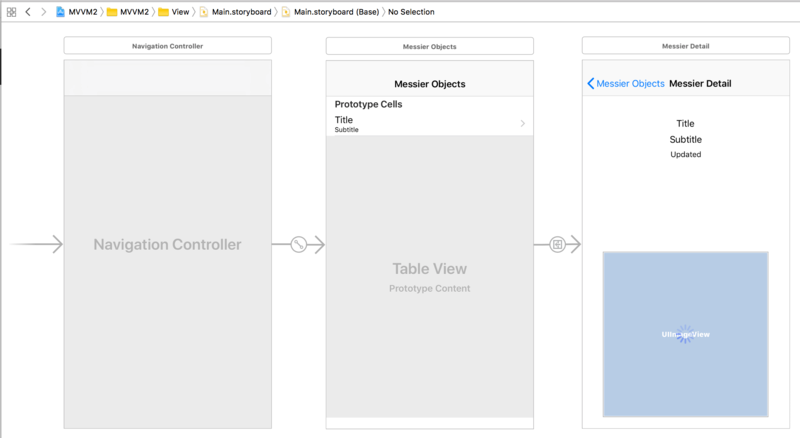 I rather work with views/controls and view controllers as inseparable entities that are encapsulated in a storyboard and corresponding Swift (.swift) file(s). 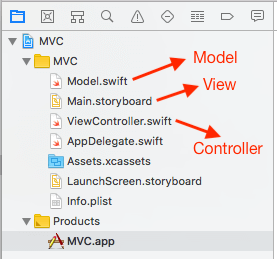 My main point is that for most of you, the “VC” in “MVC” when programming iOS means that, when working with views/controls and view controllers, the two domains have huge crossover. 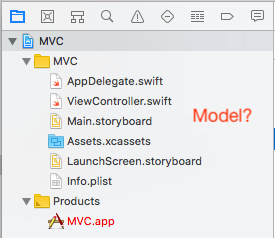 When browsing through or searching Apple’s documentation, you won’t find the word “Model” as in the “M” in MVC in terms of generic data structures to serve as models for MVC apps. This is partially a result of already-existing support for data structure-like entities such as the class, struct, and enum being intrinsic parts of the Swift and Objective-C languages. I hope that many developers would recognize these as go-to platforms for creating data models. When you do encounter the word “model” in the Apple docs, it is generally associated with very specific applications of data structures — data organization tools — like VNCoreMLModel. Of course, Apple provides Core Data, “a framework that you use to manage the model layer objects in your application,” but it often requires too much effort to get up and running and can be somewhat awkward to use. While MVC sounds good in theory, it often doesn’t deliver on its promises in the context of iOS and Xcode. Time after time, I’ve seen developers put most of their apps’ model (data) and business logic code inside of view controllers. It’s become a standing joke to refer to MVC as the “Massive-View-Controller” design pattern. It’s a natural tendency as the view controller plays such an intrinsic role in one of the most important aspects of an app’s lifecycle: interactions with the user. One of the greatest tools you can use in battling complexity is to divide and conquer. Small and logically organized pieces of code, written using a separation of concerns mindset, is probably about half the battle in controlling complexity, as we’ll see below when using the Swift extension language construct. Remember that there are other very powerful tools for controlling complexity like protocol-oriented programming (see here also), object-oriented programming, error checking, delegation, and property observers, to name a few. Excessively large view controllers can be very difficult to test. Because of their many properties, they can take on an incalculable number of states. If they contain many functions that commingle business logic with UI components, developing effective testing protocols can be a huge task. // Created by Andrew L. Jaffee on 5/17/18. // Copyright © 2018 Andrew L. Jaffee. All rights reserved. // your app's data here. I would venture that the Model-View-ViewModel (MVVM) design pattern is really not that far from what MVC was intended to be. MVVM adds one component to the MVC model, namely something called the “ViewModel” or “view model.” It can be a class or struct but is generally a class so that references of the same instance can be passed around in your code. The ViewModel sits between the view controller and Model. Remember I had mentioned earlier that, for the purposes of discussing MVC and MVVM in the context of iOS development, “views/controls and view controllers” are synonymous with the “VC” in “MVC” and the second “V” in “MVVM?” Consider views/controls and view controllers as inseparable entities that are encapsulated in a storyboard and corresponding Swift (.swift) file(s). Let’s understand this pattern by defining each of its constituent letters, M, V, and VM. M for “Model” – This is a structure that stores domain-specific information (data) in the simplest of formats. By keeping it raw, we keep it portable and reusable. For example, we could store a phone number as 10 digits or characters. We leave it to a ViewModel to transform the raw “2125514701” into something like “(212) 551-4701” or “212-551-4701” or “212.551.4701”. The View/view controller can then display the phone number representation it gets from the ViewModel. If dealing with say, dialing a number internationally, we would leave those details to the ViewModel. V for “View” – No need to go through my discussion on “views/controls and view controllers” again. Please refer above to my discussion of Preliminary definitions. VM for “ViewModel” – This is the new piece that I would add to MVC if I were king for a day. The ViewModel sits between the Model and View/view controller. The ViewModel converts data in the model into human readable format that can be presented in the View by the view controller. The ViewModel could also handle updates that users make to data presented by the View/view controller, perhaps using a property observer or something like key-value observing (KVO). Updates to View data would not go directly to the Model, rather they would be triggered by the view controller talking to the ViewModel which would then talk to the Model. As a concrete example, the ViewModel could use a DateFormatter to convert a primitive representation of a date in the Model into a format readable by a user looking at the View. The View/view controller presents Model data to the user and may allow updates to that Model data. The View/view controller does not talk directly to the Model. The View/view controller can only talk to the Model indirectly through the ViewModel. The View can only communicate with the view controller. In the UI, app data is provided to the view controller for display by the View solely by the ViewModel, and any changes made to data in the View must be passed to the view controller which solely communicates with the ViewModel. The ViewModel is the intermediary between the View/view controller and Model. It is a single conduit, a gatekeeper, through which data flows from the Model to the View/view controller and vice versa. The Model is soley a data structure meant for storing domain/app-specific information. Only the ViewModel talks to the Model. Only the ViewModel talks to the View/view controller. Just getting people to understand the difference between MVC and MVVM can be a challenge, so I didn’t want to muddy the waters in this tutorial with too many advanced topics. For example, I could’ve shown you how a user edit to a UITextField could be caught by a view controller, the view controller could set a property in the ViewModel, and a property observer could’ve updated the Model… but I didn’t. Conversely, I could’ve shown you how the ViewModel could monitor the Model for changes, and then update the view controller which updates the view… but I didn’t. Finally, I could’ve shown you what I consider to be very cumbersome Swift code for KVO that I could’ve placed in the view controller… but I didn’t. Swift 4’s current implementation of KVO looks heavy-handed, obtuse, intimately tied to Objective-C, subject to change, and probably a good candidate for deprecation. As always, there are a variety of opinions about the MVVM design pattern. I’m a pragmatist, not a dogmatic, not an absolutist. When I hear statements like “never import UIKit into the ViewModel Swift file(s)” or “never pass a closure from a view controller to the ViewModel,” I say, “I’ll evaluate the situation when I encounter it and then choose the simplest and safest approach.” You’ll see examples of both of the previous two admonitions below. One topic of argument over MVVM that I see constantly popping up is the question of where in the design pattern to put networking code for downloading files. For me, the answer is simple: put networking code for downloading files in the ViewModel. A model stores raw data and doesn’t know that, for example, a file needs to be downloaded over a certain transport like HTTPS and displayed in some specific control like a UIImageView. Conversely, the ViewModel layer is closer to the presentation layer, handles data, and should probably know about details like where a file is stored and how to get it. 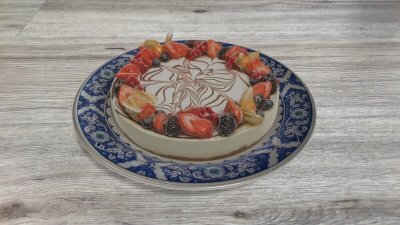 Just where precisely is the “best” place to download files in an MVVM app? Is there always a “correct” answer? 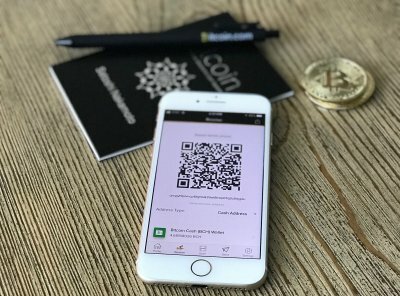 I built a prototype app as a proof of concept for my final app. I wanted to see what the UI woud look like, what frameworks I’d need, how much code I’d have to write, and what kind of code I’d have to write. Most importantly, I used the MVC design pattern to see how easily people can fall into the trap of writing “Massive-View-Controller” code as opposed to actually using the MVC design pattern. As I’ve noted previously, this kind of app — Massive-VC — is still what I see most often when meeting new customers and helping them develop quality iOS code. Most of you should understand what I’m doing here. I’ve wired up a UITableView to display a few rows of data. Clicking on each row performs a segue that displays a detail screen which can show much more information than just a row. I’ve embedded my main UIViewController subclass in a UINavigationViewController so that my segue pushes my detail view controller onto the screen with a nice hierarchical burrowing slideover. The user can then return to the UITableView using that oh-so-convenient “< Back” button. Remember what I call the “VC minus M” flavor of the Xcode MVC pattern? Let’s look at the main UIViewController code and discuss it. I’m going to describe the code in a series of steps — steps that are also comments in my code shown below. So as you read the steps in this section, please refer to those same steps in the code below. // #1 - WHY ARE ALL THESE PROTOCOLS ADOPTED HERE? // #2 - WHY IS THE MODEL IN THE VIEW CONTROLLER? // #6 - WHY IS THIS IN A UIViewController SUBCLASS? tableViewCell?.detailTextLabel?.text = dataSource[indexPath.row] + " subtitle"
As we’ll see in the following discussion, most of the problems I’ve commented on in the code above are violations of the divide and conquer, separation of concerns, or single responsibility principle axioms. These are all terms you should look up and study. 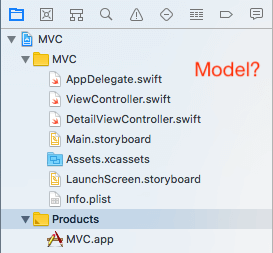 #1 – Why are the UITableViewDelegate and UITableViewDataSource protocols specified in this ViewController.swift file? Not only is this UIViewController subclass signature harder to read, all the property and/or method conformance requirements for these protocols must be implemented in this file, leading to code bloat. What if the UIViewController class required more protocols? I’ve seen examples of view controllers adopting as many as 6 to 8 different protocols. There’s an elegant solution as we’ll see in the MVVM example below. #2 – Even though the MVC pattern specifies that the “M” or Model be separate, many developers just shove the entire data model into the main view controller subclass. This violates separation of concerns and leads to code bloat, especially if the model is complex. #3 – All these callbacks, viewDidLoad, viewDidLayoutSubviews, viewDidAppear, etc., should be in this view controller subclass. The point is that a view controller already has enough responsibilities without being saddled with code that shouldn’t be in a view controller, like business logic, helper functions, data structures, data model logic… When a view controller has all this extra code in it, it becomes impossible to read, maintain, enhance, support — you name it. Time for separation of concerns. #4 – Since I’ve built so many apps that provide interactive help, I created my own help class hierarchy using OOP. It’s reusable and maintainable. It provides an index, search feature, and table of contents. I can use it in many different apps by populating its Model with app/domain-specific data. At least you could move your help-handling entry method into a different Swift file like help.swift. #5 – An instance of prepare(for:sender:) is completely appropriate here. Get rid of all the other code that violates the separation of concerns principle and there’ll be plenty of room for it. 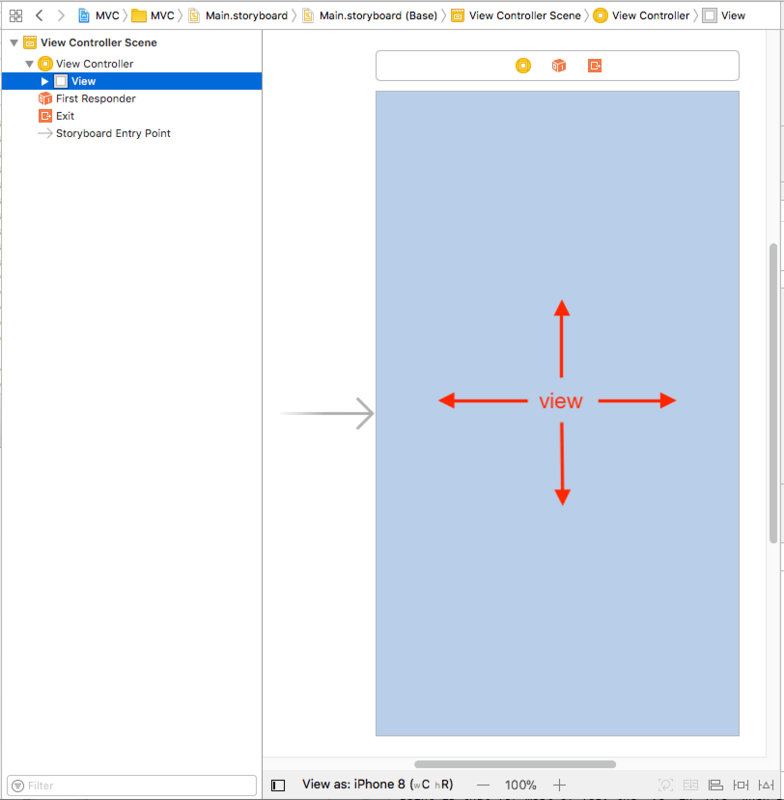 #6 – Why are all these methods required by conformance to the UITableViewDelegate and UITableViewDataSource protocols here? This violates separation of concerns. There’s an elegant solution as we’ll see in the MVVM example below. I built an astronomical Messier object explorer app following the MVVM pattern. I really followed MVVM’s separation of concerns principles. There’s a Model, there are View/view controllers, and there’s a ViewModel. We’ll go through each of these MVVM components by reading through the code and discussing the code below. Most of you should understand what I’m doing here. The same explanation I gave in the third paragraph in the the section above entitled “AN MVC APP” applies here — except my code is rationally structured using MVVM. The Model is solely a data structure meant for storing domain/app-specific information. Only the ViewModel talks to the View/view controller. Only the ViewModel talks to the Model. The Model is made up strictly of primitive data types for portability. The app interface may change. The Model may be used in a different app. I want this Model to have longevity. The only comment I would make about the code is that, instead of reading data from a NASA JSON or RSS feed, I’ve hard coded the Model data. MVVM is hard enough to understand without you having to dig through a bunch of ancillary code on parsing some structured file format. For info on use of NASA data, see this link. // #1 - "Should I Stay or Should I Go"
#2 - Define a closure TYPE for updating a UIImageView once an image downloads. // preparing data for presentation in the UI. // through public getters. No direct access to Model. // Some getters prepare data for presentation. dateFormatterPrint.dateFormat = "MMMM dd, yyyy"
return "There was an error decoding the string"
// #7 - Controversial? Should this SOLELY live in the UI? // doing is getting some NSData/Data. #2 – Notice I’m defining a closure type so I can pass code between MVVM layers. Am I violating separation of concerns? I doubt it. Closures are very convenient and maleable. #3 – For all intents and purposes, the app’s data source is the ViewModel. #4 – I’ve chosen a class as the ViewModel type so I can use reference semantics and pass the model around the app. #5 – I use some private properties solely for preparing data for presentation in the UI. For example, I store a hyperlink in the Model as a String but convert it into a URL to download a file. #6 – Data is made available for presentation only through public getters. No direct access to the Model is allowed. Some getters preprocess data for presentation. #7 – See point #1 on my “controversial” use of UIKit and UIFont in the ViewModel. #8 – Is passing an @escaping completion handler into the ViewModel problematic? Should I use KVO or delegation? All’s I’m doing is getting some NSData/Data. If changes are made to the app, I’m just as likely to have to change my delegation code as I am my closure code. Closures allow you to create chunks of almost any type of code that can be called almost anywhere, anytime (like in the future). They are self-contained but can access variables and constants from the surrounding environment in which they were defined. They can be assigned to properties, variables, and/or constants — and passed as parameters to functions/methods. // #2 - The ViewModel is the app's de facto data source. // a detail view controller via a segue. 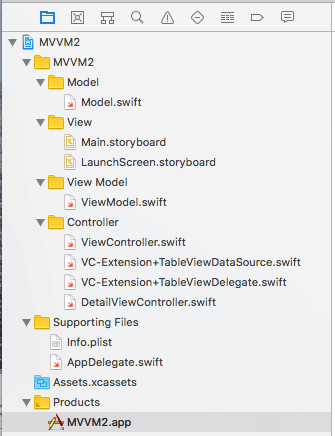 #1 – I was able to move my main view controller’s code for conformance to the UITableViewDelegate and UITableViewDataSource protocols by using the Swift extension language construct. The technique is straightforward. You may say that using the Swift extension has nothing to do with MVVM, but I would argue otherwise. One of the purposes of design patterns is to help you achieve separation of concerns and to break code into smaller, more manageable, and more logically organized pieces. See the next two files in my app project below. #2 – The ViewModel is the app’s de facto data source, not the Model. The ViewModel data for the currently-selected table view cell representing a Messier object is passed to a detail view controller via a segue. Then the user can see the Messier object on the big screen. All’s I’m doing in didSelectRowAt is de-selecting a table view row so it doesn’t get stuck as highlighted when it is selected. Users can be confident as to which rows they selected. Otherwise, once a row is tapped, it stays highlighted. // #1 - The ViewModel is the app's de facto data source. #1 – The ViewModel is the app’s de facto data source, not the Model. This code should be familiar to most of you. I’m wiring up the default prototype cell UI elements in each UITableViewCell corresponding to each Messier object stored in my ViewModel. @IBOutlet weak var subtitleLabel: UILabel! @IBOutlet weak var updatedLabel: UILabel! @IBOutlet weak var descriptionTextView: UITextView! @IBOutlet weak var activitySpinner: UIActivityIndicatorView! // once an image downloads. // MUST occur on the main thread. // #3 - Animate the appearance of the Messier image. // image is about to start downloading in background. // the user chose to inspect. // #7 - Start image downloading in background. #1 – Define a closure (completion block) instance for updating the UIImageView once an image downloads. #2 – Download occurs on background thread, but UI update must occur on the main thread (in completion block). #3 – Animate the appearance of the Messier image (in completion block). #4 – Stop and hide the activity spinner as the image has finished downloading (in completion block). #5 – Start and show the activity spinner as the image is about to begin downloading in the background. #6 – Update the UI with info from the Messier object that the user chose to inspect. #7 – Start image downloading in background. #8 – Make sure the UITextView shows the beginning text of the Messier object description. Let’s quickly walk through my storyboard. I’ve wired up a UITableView to display a few rows of Messier object data. Clicking on each row performs a segue that displays a detail screen which can show much more information than just a row, including an image of the Messier object. The images download in the background as they’re very large multi-megabyte files. I’ve embedded my main UIViewController subclass in a UINavigationViewController so that my segue pushes my detail UIViewController subclass onto the screen with a nice hierarchical burrowing slideover. The user can then return to the UITableView using the built-in “< Back” button. When developing software, we’re literally controlling chaos — at least trying to control chaos. Software complexity generally grows exponentially as developers add more code (variables, constants, structures, enumerations, classes, protocols, conditionals, repetitive constructs, etc.) to their projects. Look at the graph here and you’ll see that when a software app approaches just 6000 lines of code, complexity approaches infinity — the unknowable, the utterly unpredictable, the uncontrollable. It was estimated that Windows 7 contained approximately 40 million lines of code while macOS 10.4 (Tiger) contained about 85 million lines. Estimating the number of possible behaviors which such systems can exhibit is computationally impossible. Remember I mentioned “exponential,” i.e., where complexity approaches infinity. Any application with 40 or 85 million lines of code is infinitely complex. No one can ever know every possible state or behavior that such applications can exhibit. We can only do our best to try to control the chaos. Remember that even those “smaller” apps that you and your teams work on can easily reach infinite complexity. 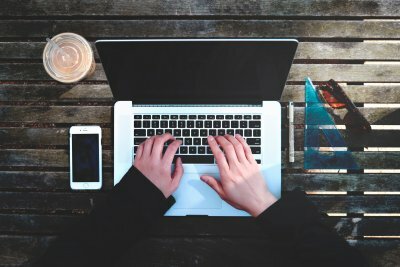 So what is a programmer to do? Continue looking at topics such as was the subject of this article: design patterns. Also look at the other tools I mentioned that were designed to help control software complexity. Look up the term “software complexity” and do your own research. Remember that there is no perfect solution and don’t get into arguments with people who preach utopian or all-or-nothing solutions. We are humans. We’re always growing. Let’s do our best.